This book examines the complex factors that led to this confrontation and the rural setting where the most intense fighting took place. The Lima government responded by unleashing the security forces on communities they did not understand, and the Senderista guerrillas took advantage of the fisures in local society. The bloodshed spanned the decade and scarred the society for years to come, costing as much as 70,000 lives. Eventually Shining Path's leader was captured in 1992 and the insurgency collapsed within months. 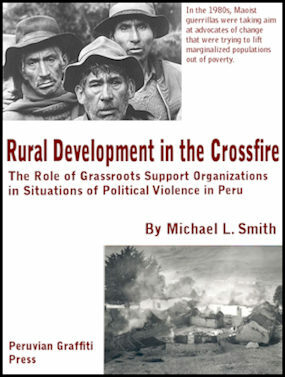 After looking at the builtup to the conflict, historical background and the cast of political actors, the book looks at two case studies of development promotion centers that were attacked by the Shining Path guerrillas: the Allpachaka agricultural station (associated with the local university) in Ayacucho in 1982 in central Peru and the Waqrani rural development program in Puno (associated with the Catholic Church) in southern Perun in 1989. These two event were never fully examined when thy took place. The book is available in electronic format from Amazon Kindle as the first publication of Peruvian Graffiti Press. The Peruvian Constitutional Tribunal ruled that the military court martials that convicted most SL ringleaders, activist, sympathizers and hundreds of innocent bystanders did not provide due process. That means that most currently convicted terrorists will receive a new trial. The political incompetence of President Alejandro Toledo has stirred up a wave of protest against government inaction, broken promises and poverty. This upheaval has provides an opportuntity for Sendero to reassert itself. Toledo also has not been able to use the strong-arm tactics of former president Alberto Fujimori to squash opposition. Drug trafficking and coca growing continue to provide a cash flow and a law-less, government-less environment in the eastern slopes of the Andes. Postcard from Prison: revolutionary art produced by Sendero inmates. The flagged mountain peaks is evocative of Andean cosmology. 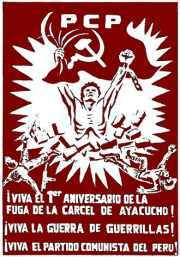 Early Poster: In 1982, Sendero attacks the Ayacucho prison and releases captured comrades. The audacity and precision of the action caught the government and the public by surprise. 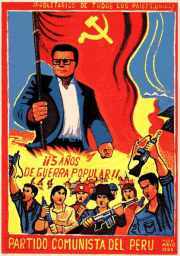 5th Year Poster: Commemoration of the start of the People's War revolves around Abimael Guzman's role in forging the movement. It used to be that the professional horizon of Senderologists or Shining Pathologists was quite promising. At least, I thought so when I came back to the States in 1990. Now, it's a vanishing breed. As a Maoist terrorist organization that has been trying to overthrow the Peruvian state since 1980, Sendero has been on the decline since the capture, trial and imprisonment of its founder and leader Abimael Guzmán, or Chairman Gonzalo, as he is known to his followers. Precisely for that reason we have to make knowledge available before we go into extinction. The current situation is that Guzman and his henchmen are serving out their prison terms, but with the prosepct of a new trail before a civilian court. The party remains alive outside jail walls because Peru still has social and economic dynamics that are always kicking out disaffected people and the drug trade can underwrite many illegal enterprises. In the meantime, Sendero has one or two small columns working in the Huallaga and Apurimac valleys on the eastern slopes of the Andes. But when measured against Sendero's past activities, the level of action does not even approach the early days of 1980 and 1981. However, government security forces are significantly weaker in operational capacity than they were in the 1990s. Warning: This information will be augmented regularly so check back again if you have interest. Please note that links to news media may be broken periodically as stories are moved into archives. We will monitor them regularly. Check our weblog for the latest events and finds. You can also search the site. During the most threatening time of Sendero's assault in 1992, I was working with the Federation of American Scientists in Washington, DC on a special project to draw attention and propose policy initiatives for the situation in Peru. We published five issues of Sendero File, a bulletin that was sent out to U.S. and Peruvian government officials, diplomats based in Washington and other interested parties. I also circulated it by e-mail to groups and people concerned about the situation. The publication gives an interesting glimpse of the times. I am making these publications available here as a record of that moment in Peruvian history when it seemed that the country was close to disintegrating into chaos, much as is happening today in parts of Africa. Peruvian town whispers in fear of '1,000 eyes', The Globe and Mail, March 1983, 20. Over the past two years, there have been a proliferation of Sendero related websites. There used to be just two. Now internal disputes and the dynamics of the Internet have let many flowers bloom. Keep in mind that anyone can set up a website. Some of the sites below are hosted on free services. Red is the predominant background color so be prepared some pretty unimaginative web design. CSRP: Committee to Support the Revolution in Peru carries information (or propaganda, if you will) about Shining Path, or Sendero Luminoso. In both English and Spanish. The CSRP and is based in San Francisco, CA and has supported SL since 1983. 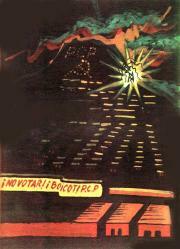 The site has some unique artwork and posters by SL activists or sympathizers. The CSRP has become very entrepreneurial by selling books, pamphlets, T-shirts, pins and stickers, videos and music CDs. They do not take Visa, Mastercard or American Express -- send a check. Since Guzman's capture, supporters created the International Emergency Committee to Defend the Life of Dr. Abimael Guzman (IEC) to raise awareness of his condition as a political prisoner. The CSRP does not use e-mail, probably because they fear that the FBI is monitoring their traffic with the Carnivore tracking system. It seems to be closely associated with the Revolutionary Communist Party (see below). Another pro-Sendero site under the name of Peru People's Movement claiming to represent Sendero itself. The site has not been updated since November 1998. El Diario, edited by Luis Arce Borja, was the mouthpiece for Sendero in the late 1980s. It reemerged in Belgium as El Diario International. Now there is an Web-version, thanks to Yahoo's GeoCities free-hosting. It also has the eldiariointernacional.com domain, but it redirects back to the Yahoo site. Sol Rojo (Red Sun) - an online magazine - Para Entender a Mariategui an early Sendero document (1968) that set the tone of the party and Huamanga. Raise the Fist's Peru page - a radical site that seems to cover everything. Seems to have been taken offline following an FBI raid on the operator's home. Apartently the site contained recipes for Molotov cocktails. Revolutionary Worker Online Bob Avakian's Revolutionary Communist Party and its Peru page. Also see A World to Win. the Marxism Mailing List is a "moderated forum for activists and scholars worldwide." It is moderated by Louis Proyect. It has about 35 detailed postings about Sendero and Peru. 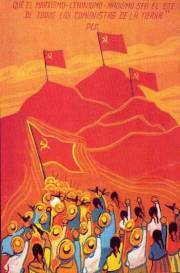 It is also an excellent reference for fitting the whole Marxist movement together. Shining and Other Paths: War and Society in Peru, 1980-1995, edited by Steve J. Stern. Published by Duke University Press, 1998. This is the most definitive text to emerge from research, with the advantage of hindsight and diminished risk. It comes out of a conference that occurred in 1995 at the University of Wisconsin. Most of the big name researchers were there. The book is made with a genuine effort to take a broader perspective on the conflict and put the process in context. Norman Gall wrote Education Reform in Peru when few had ever heard of Ayacucho or Sendero. He has one of the most insightful contributions to understanding the roots of the phenomenon because he gathered first-hand accounts about the student revolt in 1971 in Huanta-Ayacucho, which was a pivotal event in the development of Sendero. Anyone who is serious about understanding the phenomenon has to read it. Fortunately it's now online. Bulletin of Atomic Scientists - Can Fujimori Save Peru? - A touch of nostalgia about the time when outside observers were scratching their heads about what to do about Peru. Desco: Reporte Especial (1998, 57-63 / 1996 online) and Quehacer made a cottage industry out of studying Sendero. Quehacer came into its own when it started publishing reporting on political violence when the rest of the media was covering its eyes. Reporte Especial was a subscription publication that systematized information on political violence. The issues online are from the aftermath period but they may give a picture of the two years. 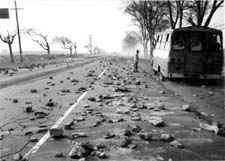 The following are major articles that follow the crucial events of 1992 and 1993, the turning point in the war against Sendero. They are all from the Washington Post and were available online the last time that I checked (December 2002). International Policy Institute for Counter-Terrorism - a short profile of Sendero with updates. Not that good.